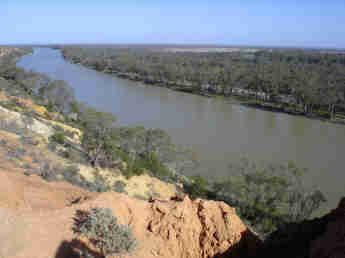 One attempt by the South Australian government to keep men of capital, energy and talent from deserting South Australia, and at the same time provide some sort of relief for people hit hard by the depression, resulted in the establishment of the Village Settlement Scheme, mainly along the River Murray to utilise 'waste lands for irrigation'. Government legislation, initiated by the Kingston Ministry and passed in 1893, provided for associations of twenty or more settlers to be formed to hold and work land as a community. Land was set aside where soils were supposed to be fertile and timber, water and food, like rabbits and fish, would be readily available. One of these settlements was Murtho. 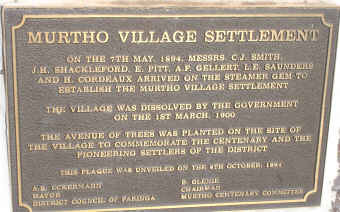 In many ways the same as all other village settlements, Murtho had the distinction of being a private venture, without any government sponsership. It was pioneered by men of capital and education who were diciples of Henry George and provided their own funds. Most families lived in stone houses, rather than tents or humpies as was usually the case in the other settlements, built along a road at the top of the cliffs. Murtho was established just above Renmark in the Hundred of Murtho which had only been proclaimed on 15 June 1893. 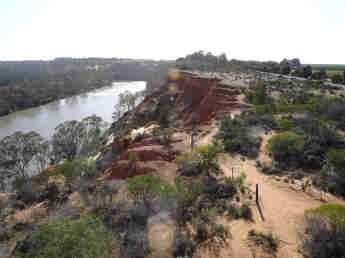 Although the site provided glorious views of the river, water had to be pumped more than thirty metres up the cliffs for irrigation. Murtho was formally established on 19 July 1894 when about ten families, ten single men and three single women made the trip to start the new association, its motto being 'From each according to his ability, to each according to his need. 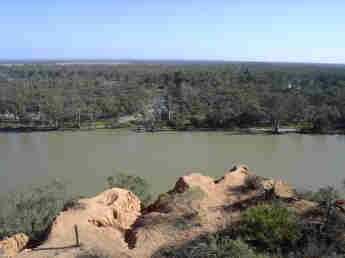 Henry Cordeau was appointed first chairman, but as his wife refused to live at Murtho, they settled at Renmark instead. Oscar Hooper was later elected Chairman. Murtho cliffs seen from the Headings Lookout Tower. Dame Roma Mitchell on 2 July 1991. In 1895 John Napier Birks, chemist of Port Adelaide, and his family moved from Woodville to Murtho. They travelled by train to Murray Bridge and continued by steamer to Murtho. One of his sons had already left for the New Australia settlement in South America. His eldest daughter, Elsie Ellen born in 1872 at Magill, took charge of the small school at Murtho until she married Erskine Gilmour in 1897. John Birks became the doctor, J.P., and storekeeper of the young settlement. The store opened once a week when the women came in to have their bags and tins filled. Each month the paddle steamers Ellen and Gem also called in to sell their goods and services. Birks' brother Walter looked after the dairy cows and the milk. Some of the other original families at Murtho were Dix, Hooper, Pitt, Richards, Shackleford, Smith and Walker. The Walker and Richard families were the first to return to Adelaide. During its operation the Board met several times each week in the school building to decide what work had to be done, by whom and when. Nominally a temperance settlement, the Board approved the opening in 1897 of a Community Hotel as long as all its profits went to improvement of the town. Conditions were rather primitive. There was a small library, a diningroom for single men, run by Marion and Isabel Gilmour, a carpenter's shop, a smithy and three small boats. Most of the settlers put up with these conditions and enriched their lives in other ways. They formed a reading club and occasionally attended church, a concert or lecture in Renmark, followed by a moonlight picnic. Most of the time Sunday services were held in private homes at Murtho. Public holidays were celebrated by a picnic and birthdays by a dance. Everyone learned to swim, the females at the ladies' beach and the men at theirs. Each house had its own garden of fruit, flowers and vegetables and water melons were planted along irrigation channels. Unfortunately the late 1890s were very dry years. Little rain fel and the river was so low that steamers failed to arrive, nearby settlements could only be visited by rowing boat and pumping for irrigation became impossible. By 1900 most settlers had given up and left the settlement. It suffered the same fate as the government sponsored settlements. After the Utopian ideas had proved unworkable, G.J. Dix was appointed manager. After the collapse of the project he said that the real reason for the failure was that 'Some people were prepared to work, whereas others were prepared to let them'.